The town of Breckenridge implemented a paid parking plan in December of 2016 to help take down on traffic congestion. The town has already seen evidence that the system is helping. Call with questions or suggestions for parking in Breckenridge. The new paid parking system has been in Breckenridge for over a month, and spots have already become a little easier to find. The system was implemented on Dec. 1 to encourage locals and tourists alike to find other ways of commuting into town, and hopefully reducing the town’s traffic woes. “We’re achieving exactly what we wanted to do, which is one to two open spaces per block even on the busiest days,” said Kim Dykstra, the director of communications for the town. Although official numbers for parking are currently being reviewed by town staff, there has been an impact on the amount of people who use mass transit. Bus ridership within the town has already seen a spike. Dykstra said that in 2016 the town had more than 885,000 commuters take the Free Ride bus system in Breckenridge. The numbers for January are continuing to increase as well. “We had our highest ridership number on a day basis on Jan. 14, last Saturday,” Dykstra said. Nearly 9,000 riders got on a bus in Breckenridge that day. The road to paid parking was a bumpy one, with the town council creating an advertising campaign acknowledging that the decision was an unpopular one. The website for the campaign, Breck Forward, included videos from councilmembers on how to use the parking kiosks and a breakdown of the long-term plan from the town’s parking task force. Before paid parking even started, police chief Dennis McLaughlin reported during the Nov. 22 council meeting that one of the solar panels on a kiosk had been damaged. At the time, the police reported that they could not determine the reason, but that the damage had been purposefully done. “I don’t know why the damage was done and at this time we don’t have a suspect, although we are keeping a closer eye on the kiosks now,” McLaughlin wrote in an email on Thursday. He added that there has not been any damage to the kiosks recently, but that they have had to clean stickers off of some of them. The town has also had their hands full with incoming calls when the system acts up. Sergeant Lyn Herford with the Breckenridge Police Department said in an email that during the first week of paid parking the community service officers in Breckenridge were averaging 15 phones calls a day from people needing help with the kiosks. Herford is in charge of parking and community service in the town. She said that every parking machine has a sticker with a phone number that will forward to the community service officer on duty. The phones are managed during the paid parking window, from 10 a.m. to 8 p.m., seven days a week. Some of the errors are due to the machine. Herford said that they are working with the company to keep screen prompts up longer on the kiosks. Dykstra added that they are also working to improve issues with the 15 minutes of free parking, as well as credit card problems. For people looking to park in town, who are having problems with the kiosks, there is also a mobile option. The app, PassportParking, seems to be popular with users. 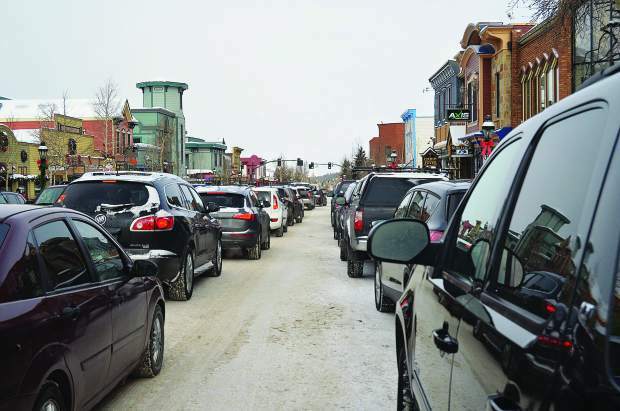 More than 13,000 people paid for parking in Breckenridge through the app in December. Paid parking is not entirely new to the town. The town added streets within the downtown core to a list of parking lots that were already charging hourly. The town changed the rates for those lots, so that they better matched the new plan. The added parking locations have caused a bump in town revenue. Compared to last year, Breckenridge saw an additional $65,000 coming in from December parking. The money goes right back into the town’s parking and transit budget, improving walkability within town, general maintenance on buses as well as potentially adding new lines.